Ubiquitous and seamless wireless coverage gives faculty the necessary tools to pursue innovative teaching and learning initiatives, says Ohio University CIO J. Brice Bible. Ubiquitous and seamless coverage gives faculty the tools to pursue innovative teaching and learning initiatives. Anne Rawland Gabriel is a freelance journalist who specializes in business technology. She is a frequent contributor to the CDW family of technology magazines. No matter where Zachary George goes on the campuses of Ohio University, he enjoys network ­access at his fingertips. "Everything that I need can be accessed fluidly via my laptop, cell phone or any other device," the student body president and senior says. He has the Athens, Ohio, university's new wireless network to thank. As is the case on many campuses from coast to coast, officials at Ohio University found that keeping pace with the boom in mobile devices, accommodating the BYOD trend and meeting user expectations make "wireless everywhere" an essential strategy. Craig J. Mathias, a principal with the wireless consultancy Farpoint Group, says there's a paradigm shift under way on college campuses toward a holistic approach to the wired and the wireless network. 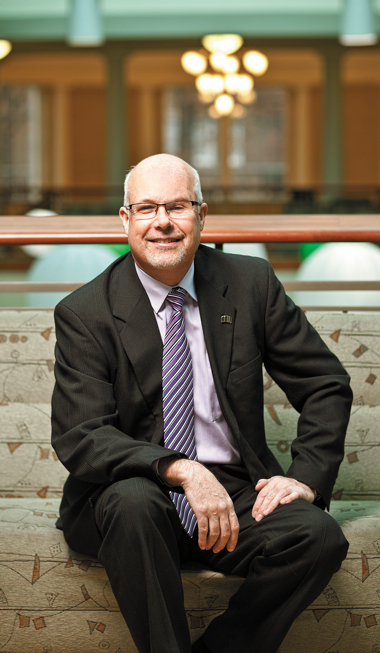 At Ohio, the IT team has fully embraced that ­holistic approach. But it's not the only option out there, Mathias notes. "Although wired LANs continue to enable fixed users and devices, their primary role today is supporting wireless users," Mathias says. "We're even starting to see unified management, where control of both the wired and the wireless networks occurs from a single console." Ohio recently wrapped up a multiyear initiative to update and blanket indoor and outdoor spaces with seamless roaming access on all five campuses. The 37,000-student institution used a new Aruba WLAN, selected for the quality and performance it demonstrated during an on-campus pilot, says J. Brice Bible, Ohio University's CIO. The network is viewed as an essential extension of the school's historic focus on the undergraduate experience. The upgrade found Ohio installing 4,500 access points across 200 buildings and 1,800 acres using a mixture of Aruba models AP-105, AP-124 and AP-13. To connect the dots, 16 Aruba M3 controllers were installed in an N+1 controller configuration, to permit access points to automatically roll over to another controller if one fails, Bible says. "We standardized on the design, capacity and infrastructure across all locations so students get the same experience regardless of their campus location." Combined with Aruba's Airwave advanced management tools, the configuration minimizes administration. "We manage the wireless network for all eight ­locations from Athens," Bible says. "We rarely touch any of the devices." The network's robustness and reliability make wireless essential for teaching and learning, adds Shawn Ostermann, associate dean of Ohio's Russ College of Engineering and Technology. Not only does the WLAN help students and faculty collaborate in new ways, but it also is becoming part of a virtuous cycle. "Our engineering students leave here understanding how a WLAN should work," Ostermann says. "On the job, their expectations push their employers to reimagine what's possible, which is really cool." Bible says Ohio's setup also improves security. "We can detect that a device has been compromised by a botnet, pinpoint it and shut it off on the fly," he says. Other security benefits range from identifying and mitigating rogue APs installed by users to locating lost or stolen devices. "We're able to tell law enforcement a device's location within a square meter," Bible says. But it isn't just APs, controllers and management technologies that keep the WLAN humming. Backhaul is equally important, Bible says. In 2008, in advance of the WLAN project, the school modernized its wired network with redundant 10 Gigabit Ethernet capability from Juniper Networks. "We wanted not only higher capacity and seamless roaming, but also better encryption and excellent quality of service to eventually enable Voice over IP traffic, along with expanding use of video in the curriculum," he says. "With this generation of infrastructure in place, we're now beginning the process of planning our next-generation WLAN." Another institution taking a holistic approach is Bryant University, where officials are tightly integrating wired and wireless networks. Because the Smithfield, R.I., university already had an underlying Cisco Systems–enabled wired network, a Cisco wireless setup was chosen, says Rich Siedzik, director of computer and telecommunications services. "With more and more users accessing the network with devices that don't even have a wired connection, we wanted the same level of sophistication on the wired side as wireless," he says. Using Cisco Prime Network Control System series appliances, the IT team at the university can centrally and transparently manage both the wired and wireless networks. "We have 650 APs blanketing our campus, based on six users per AP," Siedzik says. He says the university will continue to increase density over the foreseeable future using Cisco 3500 and 3600 APs, alongside a few Cisco 1252s that will be replaced over time. Like Ohio, Bryant uses an N+1 strategy for its controllers with a combination of newer 5508 models and older WiSM2 units. "The self-optimizing features of the network work well," Siedzik says. His team also appreciates the device's self-provisioning capability because Bryant's modern classrooms can contain a dozen fixed wireless devices, each requiring their own IP address. "At our institution, it's not just bring your own device, which we welcome, but also the other devices that were once wired, such as displays, projectors and printers," Siedzik says. For security, the 3,400-student Bryant relies on the newer 802.1X standard. "We went to it about a year ago to boost security," Siedzik says. "Not only was it easy and straightforward, but it also is very compatible with our one-to-one Windows laptop program." The expanded variety of tools that students and faculty want to use on campus definitely is driving integration efforts. That's why officials at Quinnipiac University say they are taking ubiquitous BYOD access a step further. "We're emphasizing bring all your own devices, or B-A-YOD, to students, faculty and prospective students," says Brian Kelly, director of information security and network operations for the 8,500-student institution in Hamden, Conn. "Just in the past 24 months, we've seen a shift toward even Blu-ray players and TVs in dorm rooms going wireless. Where once there were four students in a residence hall room with four devices, those same four students now have 20." "We're emphasizing bring all your own devices, or B-A-YOD, to students, faculty and prospective students." That is also true in Quinnipiac's classrooms. "Faculty are bringing in tablets and smartphones with apps like clicker response systems. They're doing all sorts of cool things," he says. Quinnipiac seeks to provide the same quality of wireless experience on campus that students or faculty expect at home. "Yet, we've scaled out our WLAN on all three campuses with the same two FTE count as we had six years ago," Kelly says. "And the two employees are the same individuals now as before. Neither of them talks about being overworked or stressed out." Kelly credits his team's success at delivering broader and more seamless wireless access to standardizing on Aruba equipment. Quinnipiac's WLAN includes nearly 1,575 access points serving indoor and outdoor spaces using a combination of Aruba models AP-65, AP-70 and AP-125. On tap for its new medical school building are AP-135 units. Enabling Quinnipiac's APs are eight Aruba 6000 controllers, along with one 3200 unit and 300 S3500 switches. "Aruba allows us to continue to adapt to unknowns," Kelly says. "For example, we're working toward adding device profiling to existing role-based profiles for more security granularity. So, for a tablet, you'd get a role that's more restrictive than your desktop or laptop."